25% polling recorded in Uttarakhand. The poll percentage in Uttarakhand reached 25%. With the temperature getting warmer the poll booths across the State are witnessing an increase in the footfall. 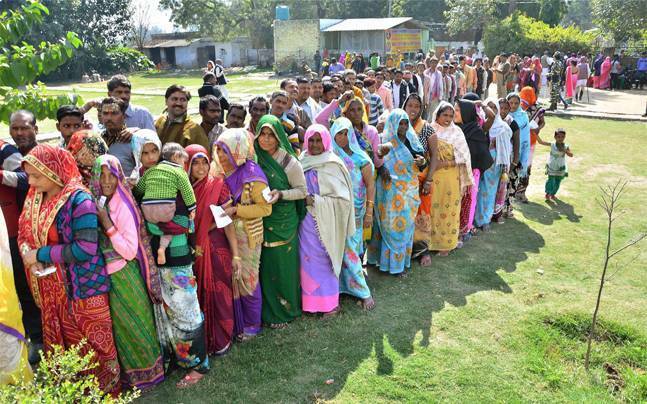 Till 11 am, Haridwar district witnessed highest polling percentage of 28%. The lowest voting percentage of 20% was witnessed in Pauri and Almora districts. Polling begins on a slow start due to low temperatures across the State. By the end of the first hour, the poll percentage remained under 7%.In the first hour the lowest turnout – 3% – was witnessed in Champawat, and the highest turnout of 7% was witnessed in the districts including Almora and Udham Singh Nagar. Chief Minister Harish Rawat will offer prayers before casting his vote, today. Mr Rawat is contesting from two seats – Haridwar Rural in Haridwar district, and Kichha in Udham Singh Nagar district.While the Chief Minister hails from the Kumaon hills, he chose to contest the plain seats. By his own admission, Mr. Rawat chose the seats to attract votes for the Congress in the 11 seats in Haridwar district and in the nine seats in Udham Singh Nagar district. About 74 lakh electors will cast votes for 628 candidates today. The polls will be conducted on 69 of the 70 seats, since the polls on the Karnaprayag seat have been postponed to March 9. While there are 10,685 poll booths across the State, 458 booths have been set up in snow covered regions where, the difficult terrain makes the setting up of a poll booth a challenge for the election commission teams. In the absence of any third forces the main contest is between the Congress and the BJP. However, the BSP is a challenge, especially for the Congress, in the 20 seats of Haridwar and Udham Singh Nagar districts.